The freedom of Jazz meets the energy of Rock! With a lot of spirit b3 turn sophisticated arrangements into songs with unique melodies and an intense groove, catchy and tight, impulsive and unleashed. Both Rock and Jazz fans get their money’s worth. Two big „unknown known“ of the music scene form the core of this perfectly harmonising Fusion quartet. Keyboarder, composer and music producer Andreas Hommelsheim and guitarist and singer Ron Spielman. You may not know their names but you have certainly listened to their music in one way or another. Bandleader Hommelsheim played with Alphonse Mouzon, John Lee and Gerry Brown, shared the stage with Kool & the Gang and worked with stars such as Nena, Nina Hagen, Jan Delay, Smudo, Max Raabe, Ofrah Haza, Ute Lemper and Jennifer Rush. As an award-winning music producer of countless German versions of famous movies from “Arielle”, “The Beauty and the Beast”, “The Hunchback of Notre Dame”, “Pocahontas”, “Aladdin” and “The Phantom of the Opera” to “Ice Age 4”, “Epic” and “The Polar Express”, he worked in all renowned studios in the world together with greats such as Andrew Lloyd Webber and Hans Zimmer. As the producer of the original German soundtrack of „The Lion King“ he received a Gold Record. A powerful voice and an electrifying guitar playing, that is what makes Ron Spielman’s performances a cult. Since decades fans have appreciated the distinctive and virtuoso guitar playing and the excellent songwriting of this unique musician. Concerts with Andreas Kummert, Flo Mega, Stevie Wonder, Bob Geldof, Chick Corea, the Little River Band, Steve Marriott, Dave Stewart, the Climax Blues Band, Johnny Guitar Watson and many more decorate his vita. With „Back To My Roots“ (2014) and „Memories in Melodies“ (2015, mixed by John Whynot, mastered by Kevin Reeves at Sterling Sound) b3 released two albums so far that convinced the music press and keeps the numbers of their fans constantly growing. Everywhere b3 show up, they impress their audience! In 2017 the Fusion quartet released their first live album, „Get up! Live at the A-Trane“, presenting themselves in one of Germany’s most renowned jazz clubs having a lot of fun playing. The special thing about is that the band plays almost exclusively new songs! In this way “Get up! Live at the A-Trane” is not a usual live record but a unique snap-shot of previously unreleased songs! Both Rock and Jazz fans get their money’s worth. In Hommelsheim’s compositions his love to film scores is unmistakeable. Starting from the concentrated energy of a quartet, Hommelsheim develops his ideas and makes the listener feel like being at the movies. Jazz, blues and rock merge to an imaginary force that send you through a rainy Paris, to a California bar and back to New York City on the Lincoln Highway, driven by this incredible groove created by Christian Krauss resp. Gérard Batrya (since 2018) on bass and Lutz Halfter on drums. Funk or rock music, dreamy or euphoric, the songs in their tone are just as versatile as they are in their emotions. You may call it acoustic cinemascope when Hommelsheim’s melodies and hooks meet on a virtual screen! 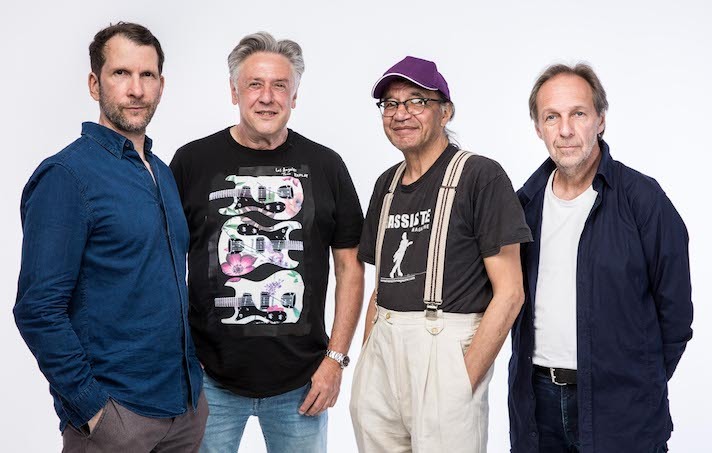 Full of spirit b3 celebrate their entertaining mixture of Jazz, Rock, Funk and Blues taking the liberty to do what their musicians’ heart beats for. Passionately, compellingly, enthrallingly.